Safely chaperoning FCC Commissioner Brendan Carr’s ascent on an antenna atop a 2,000-foot tower are Ammon Snyder , at left, and Mike Young below. The techs had to chip off ice to ensure a safe climb. FCC Commissioner Brendan Carr on Friday conducted a site visit to the KDLT TV broadcast tower located near Rowena, S.D. and climbed the top portion of the 2,000-foot tower. On Thursday, it was an almost balmy – for South Dakota – 50 degrees. But when Carr arrived on site it was 30 degrees and snowing. During his site visit, Carr, accompanied by experienced technicians from Sioux Falls Tower & Communications, was fitted with the appropriate fall protection equipment and ascended near the top of the tower utilizing the structure’s elevator, a 20-minute ride. 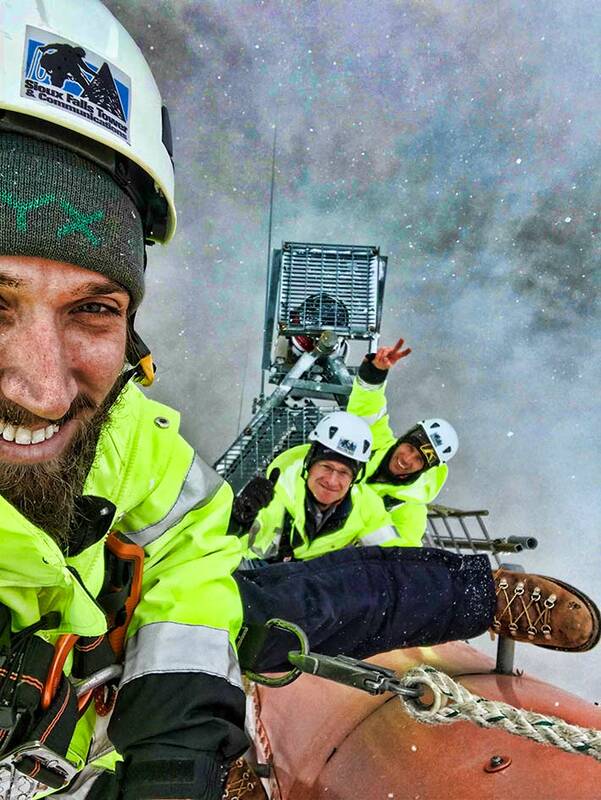 However, before he started climbing an off-line antenna that is scheduled to be exchanged for a new antennae for the repack in a week or two, Sioux Falls’ techs had to chip away ice to ensure a safe climb. While on the tower, Carr received valuable information on the type of repack work that is currently taking place on tall towers around the country. The visit was focused on providing an update on the progress of the broadcast repack transition that the National Association of Tower Erectors’ broadcast contractors are involved in. In May, Carr received an enlightening Cook’s tour of tower site work, following it up later in the month climbing a monopole. In August, FCC Chairman Ajit Pai also put boots on the steel and climbed a 130-foot cell tower in Colorado. Prior to the broadcast tower site visit, Carr and his Chief of Staff Jamie Susskind joined South Dakota Congresswoman Kristi Noem at a lunch meeting with South Dakota-based NATE member companies and broadcast industry stakeholders. “Broadcast TV stations and NATE share a great relationship committed to providing local news, weather, sports and emergency weather information to millions of Americans every day,” said NAB President and CEO Gordon H. Smith. 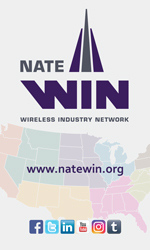 “NAB appreciates the efforts of NATE to educate the FCC about the challenges faced by tower crews and broadcasters to uphold this commitment. We thank Commissioner Carr for visiting a broadcast tower site and experiencing first-hand the work of NATE and local broadcasters to complete the incentive auction repack safely, under budget and on schedule,” added Smith. “The FCC’s historic and successful 600 MHZ Incentive Auction has led to an active broadcast repack transition, currently resulting in enormous amounts of tower construction and modification work on tall broadcast structures,” said Executive Director Todd Schlekeway.